The Boston Red Sox reviewed the Season Ticket Holder information for this listing and verified that it matches their records. All Listings need to be verified by the Boston Red Sox. If all of the Listing details are accurate and conform to the website guidelines, the review should be completed shortly. When listings are edited, the changes are also subject to review. The Boston Red Sox will contact the Season Ticket Holder if there are any problems with the Listing. The Boston Red Sox reviewed the Season Ticket Holder information for this listing and verified that it matches their records and verified that the Season Ticket Holder has the rights to purchase tickets in this location. However, the account has not yet renewed for the upcoming season. You may Ask a Question of this listing but you cannot Make an Offer until they renew. Help this Season Ticket Holder renew by Asking a Question to let them know you are interested in sharing their Season Tickets! You must be logged in to ask a question! Please login or sign up. You must be logged in to send an offer to this Season Ticket Holder. You must be logged in to save this Listing. Join this existing Season Ticket group! Nice Loge Box aisle seats close to the wall along the left field line. All tickets are priced at 2019 season ticket prices. Are you still looking for partners for 2017? Yes. I had one last year and so far you are the first to contact me. .
Hello. Is this listing is still active for 2017? If so, I have a few questions. Are these seats right along the wall? I thought there was a non-alcoholic section in this area. This isn't it, is it? How would tickets be allotted? Perhaps a draft of some kind? Finally, would the purchaser be entitled to a proportionate share of any post-season tickets? Thanks. Hi Mark - This is for 2017. This is my fourth year with these seats. There is one row in front of my row. I have the last 2 seats in JJ and since the rows are angled away from the wall the seats aren't too far from the wall. Grandstand section 32 is alcohol free which is behind Loge Box 164. I just added the listing for 2017 and put them at face value. I will be making some adjustments to lower the prices closer to the season ticket price. I think any potential partner would select games and submit the offer and then I can accept, reject or suggest some changes. I'm not planning on a draft. I would give first consideration to partners for post season but it depends on how many tickets. If taking 20 or 40 games I can do proportionate but say 8 games which is the minimum it's not likely. Did you receive my acceptance of your offer? Hi Kenneth - I just accepted this morning. Thank you. Hi Ron.. interested in 10 games.. still looking for partners ? Hi Tom - I'm am very interested in finding partners. I just updated my listing as there was 1 additional game the I sold. I still have 48 games available. I'm not 100% sure how partners work but if you are interested I think you need to select games from my listing and choose make offer. Hi there, love your seats, this is my first time doing the season ticket partner board and not 100% sure how it all works. Looks like I would have to purchase a minimum of 8 games. How would we select the games? Hi - I don't see where I can change the minimum of 8 games. I'm not sure why it's 8 but that seems to be the default. My listing includes the games that are currently for sale. To be honest I'm not exactly sure what you can see but I think you can see the listing of games. You would then have to select the games and pay with Paypal. I will look at the website for more details. I have the tickets listed at 2015 season ticket prices which on average is about $9 less that 2016 face value. Ron - I am considering a package of seats and appreciate you giving me an opportunity to purchase them. Is the opportunity to purchase playoff tickets included if I hit a certain # of seats the regular season? Hi Tom - A lot depends on how the far the Sox go in the playoffs and how many home games there are but I would be selling some. If someone took 40 games I would split the playoff tickets. If someone took 20 games then minimum 2 games and for 10 games at least 1 game, If you have any thoughts please let me know. I updated my inventory today as I sold some over the weekend. I think I will lowering the price by $5 per ticket as the tickets are priced at 2015 regular season prices but the season ticket price is $5 less. 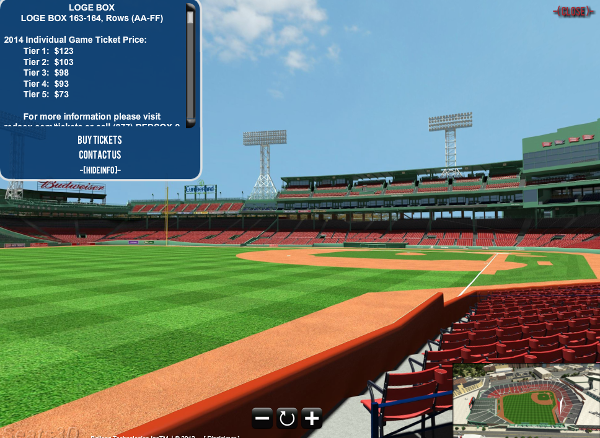 I got that picture from the Red Sox when I bought the seats year. The seats are back a rows as the picture says AA to EE and my seats are JJ but they are close to the wall. I mentioned in my other response how the seats are angled from the wall. The seats are 1 row from the wall. My seats are in JJ. In front of my seats is Row II and that is very close to the wall. The seats in this section are angled away from the wall. I have seats 11 and 12. Seat 12 is an aisle seat and closest to the wall in my row. Make an offer to share Season Tickets. Get the tickets you want now! Have a question for this Season Ticket Holder? Get answers before you make an offer. Interested in this Listing? Save it so you can easily find it later. This listing has been saved by 108 people. Login to ask a question or make an offer. If this is your listing, login to make changes. Copyright © 2001-2019 MLB Advanced Media, L.P. All rights reserved. Season Ticket Sharing Services provided by SplitSeasonTickets, LLC. & OnlineDraft, LLC. SplitSeasonTickets, LLC. does NOT sell tickets and does not set ticket prices.